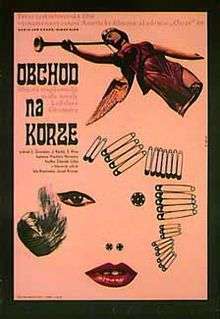 The Shop on Main Street (Czech/Slovak: Obchod na korze; in the UK A Shop on the High Street) is a 1965 Czechoslovak film about the Aryanization programme during World War II in the Slovak State. The film was written by Ladislav Grosman and directed by Ján Kadár and Elmar Klos. It was funded by Czechoslovakia's central authorities (as were all films under the Communist regime), produced at the Barrandov Film Studio in Prague, and filmed with a Slovak cast on location at the town of Sabinov in north-eastern Slovakia and on the Barrandov sound stage. It stars Jozef Kroner as carpenter Tóno Brtko and Polish actress Ida Kamińska as the Jewish widow Rozália Lautmannová. The film won the 1965 Academy Award for Best Foreign Language Film, and Kamińska was nominated in 1966 for Best Actress in a Leading Role. The film was also entered into the 1965 Cannes Film Festival. The screenplay had a bilingual Czech−Slovak history. The screenwriter Ladislav Grosman (1921–1981) was born and grew up in Slovakia. Grosman published his precursor to the screenplay, the short story "The Trap" (Past), in Czech in 1962. Only three of its themes made it into the film. He subsequently reworked and expanded it, still in Czech, as a literary-narrative screenplay published in 1964 under the title "The Shop on Main Street" (Obchod na korze), which already contained the film's storyline, although not in the usual (American) screenplay format. He then reworked it into a shooting script with Slovak dialogues in cooperation with the film's designated directors Ján Kadár and Elmar Klos. The only other language in the film is Yiddish (sometimes misidentified as German) limited to several lines that Mrs. Lautmannová mutters to herself. Her Hebrew reading from the siddur is indistinct. The Shop on Main Street was filmed on location at the town of Sabinov in north-eastern Slovakia with numerous local extras whose voices bring in hints of the eastern regional variety of Slovak. Ida Kamińska's Polish accent is employed to the same effect. ↑ "Big Rental Films of 1967", Variety, 3 January 1968 p 25. Please note these figures refer to rentals accruing to the distributors. ↑ Andrew James Horton, "Just Who Owns the Shop? — Identity and nationality in Obchod na korze." ↑ Steven Banovac, "Ján Kadár and Elmar Klos: The Shop on Main Street (Obchod na korze) 1965." ↑ Martin Votruba, "Historical and Cultural Background of Slovak Filmmaking." ↑ "The 38th Academy Awards (1966) Nominees and Winners". oscars.org. Retrieved 2011-11-06. ↑ "Festival de Cannes: The Shop on Main Street". festival-cannes.com. Retrieved 2009-03-05. ↑ Ladislav Grosman, "Past." Plamen, 1962. ↑ Ladislav Grosman, "Obchod na korze." Divadlo, 1964. ↑ English translation by Iris Urwin: Ladislav Grosman, The Shop on Main Street. Garden City, 1970. Ján Kadár, "Not the Six Million but the One." Steven Banovac, "Ján Kadár and Elmar Klos: The Shop on Main Street (Obchod na korze) 1965." Václav Macek, "From Czechoslovak to Slovak and Czech Film." Martin Votruba, "Historical and Cultural Background of Slovak Filmmaking."